Musharraf "In the Line of Fire"
WASHINGTON: President Pervez Musharraf launched his memoirs here on Monday revealing that before Kargil, India was about to attack Pakistan, Dr AQ Khan may have leaked Pakistan’s nuclear secrets to India, he (Musharraf) never conceded all demands to Secretary Colin Powell on his first phone call after 9/11 and CIA had paid millions of dollars to the government of Pakistan for handing over al-Qaeda terrorists. Musharraf has also disclosed that another plot to kill him had been unearthed in April of 2005 which was aborted by the ISI when they arrested the main plotter in Islamabad, sleeping at the back of a bus with his cell phone on. 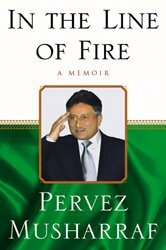 These startling revelations come in his book “In the Line of Fire” released by publishers Simon & Schuster throughout the world today with a ceremony in New York at the Council on Foreign Relations addressed by General Musharraf. Some of the shocking facts revealed by General Musharraf in his book could embarrass Washington, New Delhi, London, Tehran and many other world capitals but the book is certain to become a best seller in no time, reaping millions of dollars for the publishers and the writer. Washington is already stunned with the disclosure that Richard Armitage threatened to “bomb Pakistan into the Stone Age”, a fact which Musharraf recalls with regret in his book (Page 201), but his disclosure that CIA paid millions to the government in Islamabad for handing over Al-Qaeda leaders is already causing more embarrassment. More disclosures include the two secret letters written by ailing nuclear scientist Dr A.Q. Khan, one to the Iranians and the other to his daughter in London asking her to reveal all Pakistani nuclear secrets through British journalists. To Iranians Dr Khan asked them not to reveal his name to the International Atomic Energy Agency and after this issue died down he would provide them with more technology. But the most astounding statement about nuclear proliferation comes when Musharraf reveals that Dr AQ Khan’s Dubai base may have provided Pakistan’s centrifugal designs to the Indians. “There is little doubt that AQ Khan was the central figure in proliferation network but he was assisted over the years by a number of money seeking freelancers from other countries, mainly in Europe. These people, according to AQ Khan included nationals of Switzerland, Holland, Britain and Sri Lanka,” he writes. “Ironically the network based in Dubai also employed several Indians some of whom have since vanished. There is a strong probability that the Indian Uranium enrichment programme may also have its roots in the Dubai-based network and could be a copy of the Pakistani centrifuge design,” he says. About Dr AQ Khan’s letters he said: “The letter to Iran was being carried by a business partner of AQ Khan in which Khan advised some of his friends in Iran not to mention his name under any circumstances to the IAEA. He also advised them to name dead people during investigations, just as he was naming dead people. He also promised Iran more help after this event passed. The other letter was addressed by him to his daughter who lives in London. The letter besides being critical of the government contained detailed instructions for her to go public on Pakistan’s nuclear secrets through certain British journalists. Musharraf says for years Pakistan government ignored Dr AQ Khan’s lavish life style and tales of wealth, properties and corrupt practices. In hindsight that neglect was apparently a serious mistake, he says. Dr AQ Khan, Musharraf writes, was not part of the problem but “the problem” itself. “When AQK departed our scientific organisations started functioning smoothly. He was a self-centred and abrasive man and could not be a team player. He did not want anyone to excel or steal the limelight on any occasion on any subject. He had a huge ego and he knew the art of playing to the gallery and manipulating the media. All this made him a difficult person to deal with. On Armitage he writes that the threat of being bombed into the Stone Age was made but he said though it was regrettable, it had nothing to do with his decision to take sides with the US against Taliban. He listed the seven demands presented by US Ambassador Wendy Chamberlain and the State Department and said he had refused to accept two of them. Musharraf expresses shock at the aspersion that he accepted all pre-conditions of Colin Powell, made in a phone call. The Kargil operation, he asserted, was conducted flawlessly, a tactical marvel of military professionalism … Considered purely in military terms, the Kargil operations were a landmarks in the history of the Pakistan Army. As few as five battalions, in support of the freedom fighter groups, were able to compel the Indians to employ more than four divisions, with the bulk of the Indian artillery coming from strike formations meant for operations in the southern plains. “The Indians were also forced to mobilize their entire national resources, including their air force. By July 4 they did were fully prepared to hold our dominating positions ahead of the watershed. WASHINGTON: President Pervez Musharraf said in a television interview broadcast on Sunday evening that Dr AQ Khan had done what he had done because of “ego, satisfaction and money”. The much-awaited interview, recorded in Islamabad, was part of the widely watched CBS programme 60 Minutes. It failed to produce any surprises since the most sensational bits had already been aired by the print and electronic media around the world. Gen Musharraf was closely questioned as to how the centrifuges that Dr Khan is charged with having supplied to North Korea and Iran could have been taken out of Pakistan’s highly-secured and military-guarded nuclear facilities undetected by the government or the army. He replied that the military was there to safeguard the facilities from outside attack. When the interviewer suggested that in that case the internal controls were a “little weak,” Gen Musharraf disagreed, asserting that they were not weak but “very strong”. He said the centrifuges, whose designs, parts and they themselves had been sent out, could easily have been placed in a car and moved out. When the interviewer wondered if 18 tonnes of equipment could have been thus removed without anyone noticing, Gen Musharraf replied that it could not have been done at one time. “It must have been transported many times” and thereafter put on a C-130 and flown out. All the C-130s in the country are owned and flown by the Pakistan Air Force, but this question was not put to the president. Asked if the reason nobody from outside had been allowed to talk to Dr Khan was the fear that he might incriminate the army, the president replied, “That is absolutely not the case,” adding that US President Bush and CIA’s George Tenet are “very satisfied and quite comfortable with whatever we have done”. He said “the most embarrassing moment” of his life came when at President Bush’s suggestion, the CIA director George Tenet showed him Pakistani centrifuge designs, which had been sold to Libya and Iran. President Musharraf said he did not ask the CIA how it had come upon such highly classified material. The president told 60 Minutes that he ordered an investigation and discovered that the most highly sophisticated nuclear technology was not only sent to North Korea but also to Iran. He said he did not think the Pakistani people would tolerate a long trial and prison sentence for a man who is seen as a national hero. Musharraf said, “Today, he is a hero of Pakistanis because he has given us the atom bomb.” He added that he later pardoned Dr Khan but put him under house arrest. When the interviewer suggested that Dr Khan was living a life of “splendour,” the president replied that Dr Khan was comfortable but “now he does not even speak on (the) telephone”. He said Dr Khan was a lone wolf who exerted key control over Pakistan’s nuclear operations and was able to transfer nuclear technology with no official help. The interviewer described Pakistan with its nuclear weapons as the world’s “most dangerous” country. When he asked the president if he found it disturbing that those who bombed his motorcade in Islamabad were from the Pakistan Air Force, he replied in the affirmative but added that they were low-level personnel who were more susceptible to extremist, terrorist tendencies and could be indoctrinated to do such things. The president agreed that the situation had been aggravated by his alliance with the United States. He said he had been told by his director of intelligence (Lt Gen Mahmood Ahmed) after his meeting with former deputy secretary of state Richard Armitage that if Pakistan did not cooperate, then it should be prepared to be bombed into the Stone Age. Musharraf said he found Armitage’s words rude and a threat but he had to think and take action in the interest of the nation. He viewed Armiatge’s words as a threat and he felt that after what had happened on 9/11, the world’s sole superpower would be a “wounded” country and it would do anything to counter and punish the perpetrators. “And if we stand in the way of that, we are going to suffer,” he added. Thanks for the post. It had in-dept information I was seeking about the book. I can't though wait to read the book.